We teamed up with WineDirect this Holiday season to create a handy kit of marketing material to aid wineries with their holiday sales. In this post, the author shares her top efficiency wins for the holiday season, such as advices on abandoned carts, check out processes and improving POS system's check out. 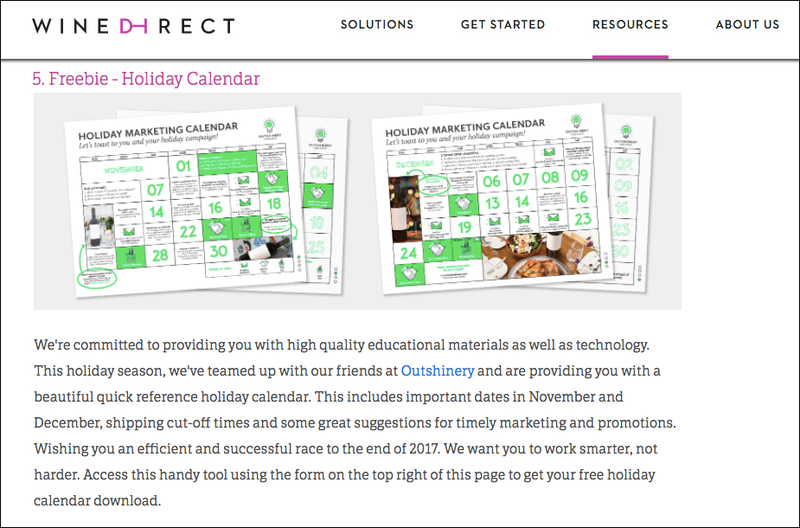 Readers also enjoyed Outshinery's Nov-Dec 2017 Holiday marketing calendar - a freebie download! The post is a two part series over the holidays that will include marketing advice and a free download to our Holiday Toolkit! Stay tuned for the next post by subscribing to our newsletter below! Welcome! Don't forget to confirm your subscription by clicking through our next email.